Cats make absolutely cute yet peculiar pets. They do some weird things and have those few habits that stun every owner! Cat owners take pleasure in their adorable antics. These precarious pets are a unique combination of mystery and cuteness. Your furry friend can be surprisingly lazy yet so supple and stable when she decides to jump around and play. A cat owner experiences moments of pride, agitation, and confusion when it comes to their little partner. Littlest of things can bother us and leave us in doubt. If you are confused why your cat is eating grass and if it's safe for her then here is a short answer to the most important question – yes, it is safe for your cat to eat grass. There is absolutely no harm in it as long as it has not been chemically treated. 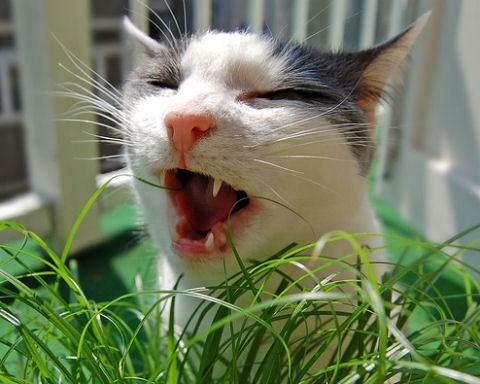 So, why is your cat eating grass? There could be various reasons why a cat would eat grass. It is common, especially for outdoor cats. Usually, cats get many dietary benefits from consuming grass. Why is my cat eating grass? Is it healthy? Grass juice is a source of folic acid which is a very important vitamin. It supports a cat's growth and health by increasing the oxygen levels in their blood. To supplement their diet, especially if it lacks in this particular nutrient, a cat would go out and eat grass. Grass also provides laxative benefits and regulates the bowel movement. It is also usual and common for cats to throw up after eating grass. This behavior is understandable because a cat does not have the necessary enzymes to digest large amounts of grass. Cats eat large amounts of grass on purpose because when they vomit, they also clear their stomach of feathers, fur, bones, and parasites which can possibly irritate the digestive tract. Any cat will regulate the amount of grass they consume based on what they want to do. If she wants to clear her stomach, she will consume amounts larger than what she can digest while for usual dietary and laxative benefits, she will eat them in smaller quantities. Now that you know why your cat might be eating grass and how it is quite normal for her to do so, it is time to discuss where things might be going out of hand. If the grass in your lawn has been treated with chemicals, your cat can harm herself by consuming the toxics along with the grass. So, as a responsible owner, you should make sure that either your lawn is never tortured with insecticides, pesticides, and other chemicals or you cultivate a portion of the lawn especially for your cat and ensure the portion remains safe. Another thing to ascertain is that your cat should not eat any other house plants. Just because grass is safe does not mean she can consume just about any plant so keep them out of her reach. If your cat is eating unusually large amounts of grass frequently, consult a veterinarian. Everything you need to know about your pet's habits. Why is your cat eating grass and is it good or bad for him/her?